Participants of the butcher training by Veterinarians Without Borders and ILRI (photo credit: ILRI/Michel Dione). All is not rosy however; numerous capacity and structural constraints at the slaughter and trade nodes of the pig value chain continuously pose a risk to the quality of pork in most parts of Uganda. 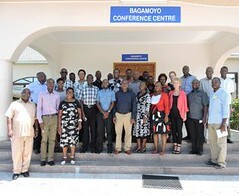 For instance, the country has only one centralized pork slaughterhouse at the Wambizzi pig cooperative society in Kampala that supplies the bulk of the pork consumed in the city and its suburbs. For the other towns, most of the pork supplies originate from backyards where pigs are slaughtered on makeshift slabs or on the ground; to put it mildly, the pork handling and waste disposal leaves a lot to be desired. Furthermore, efforts by the government to ensure that proper pork handling and hygiene standards are upheld through inspection of pork butcheries and pig slaughter places have been further watered down by capacity and knowledge gaps among pork butchers and traders. To counter some of these challenges, the International Livestock Research Institute (ILRI) has partnered with Veterinarians Without Borders (VWB), Mukono Local Government and the Ministry of Agriculture, Animal Industries and Fisheries (MAAIF) to train pork butchers in Mukono District on pork hygiene, carcass handling and biosecurity practices. The training was conducted on 18 and 19 August 2015. 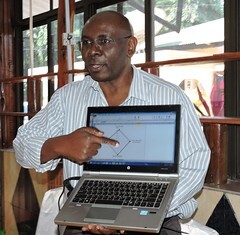 Ahead of this training, four veterinary medicine students from Michigan State University and one from Makerere University, all working for VWB, made a preliminary visit to the project sites to collect field data throughout Masaka, Mukono and peri-urban areas around Kampala that would be used to aid the design of a training manual for pork butchers in Uganda. 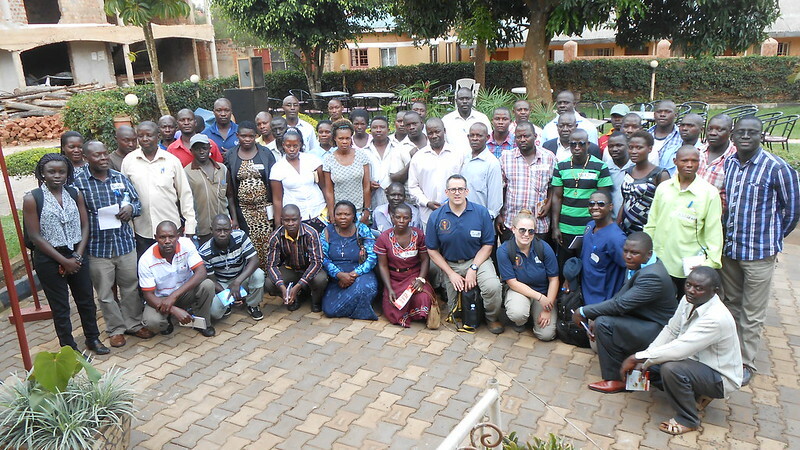 The manual comprises an overview of the One Health Initiative, proper post-mortem exam techniques, common endemic and zoonotic diseases of importance to pork butchers in Uganda, important hygiene and sanitation protocols, and biosecurity practices. Among the places that the VWB team visited were three pork butcheries and a private slaughter slab in Masaka District where they observed the traders’ efforts at hygienic handling through use of concrete slaughter slabs and hot water, however, there still were challenges in waste management as indicated by the poor drainage systems. In addition the pork at the butcheries was not adequately shielded from dust and flies which further degraded its quality. The VWB team made an extra effort to refurbish an old pork butchery, transforming it into a model low-cost outlet that will serve as a point of reference for butchers seeking to construct better outlets that conform to both safety and sanitary standards as approved by the district authorities. Demonstration of standard pig slaughtering during the training (photo credit: ILRI/Michel Dione). 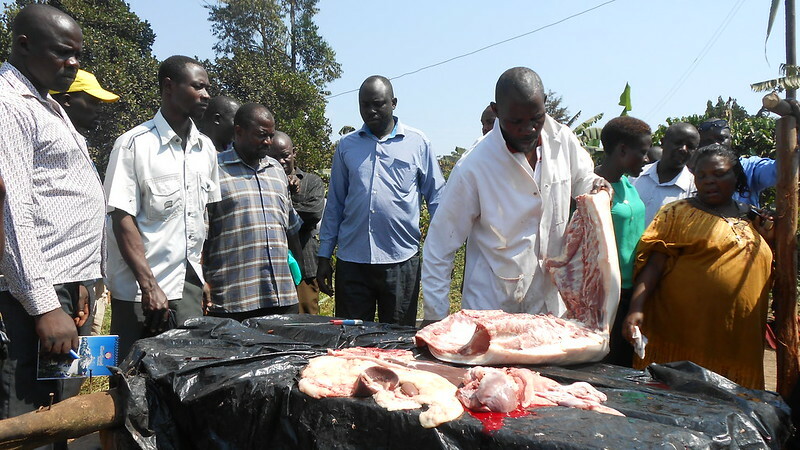 Forty seven butchers from the Mukono municipality, where most pork from the district is consumed, participated in the training that aimed at equipping butchers with the best practices in pig slaughtering, pork handling and biosecurity. On day one, the training covered hygiene and sanitation at the slaughter slab; personal hygiene; carcass handling and biosecurity for the control of African swine fever. On day two, practical slaughter techniques to enhance hygiene, carcass handling, and biosecurity practices were organized at a slaughter place, where a demonstration was done to show butchers how hygiene and biosecurity can be improved at slaughter slabs. A biosecurity package containing nylon cutting board, a basin, a bottle of JIK disinfectant, brush and serviettes was given to butchers. To monitor changes in knowledge and practices of butchers after the training, a knowledge, attitudes and practices (KAP) survey was undertaken with butchers prior the training. Also, all butcheries of the municipality were geo-referenced for follow up and monitoring of practices. Participants expressed willingness to from an association and requested support from the local government and other development institutions in the district to support the process.